Eighteen-year-old Lily Khachatryan is one of the 27 students recently selected for FAR’s Mathevosian Scholarship, which will cover tuition for a full four years—provided she is able to keep up her grades. Lily is a lovely girl with a beautiful smile, from Amasya Village in the Shirak Region. Her dream is to one day become a TV anchor, which she definitely keeps as her long-term focus as she studies at Yerevan State University. In the meantime, she’s about to start an internship at the FAR Children’s Center, where she weaves that experience into her studies as she prepares short profiles about the Center’s children, finding inspiration in each and every brave child who seeks temporary shelter and support at the Center. FAR’s 10 scholarships currently support a total of 330 students. They provide an opportunity for young Armenians with little financial means to work hard and get a better future. 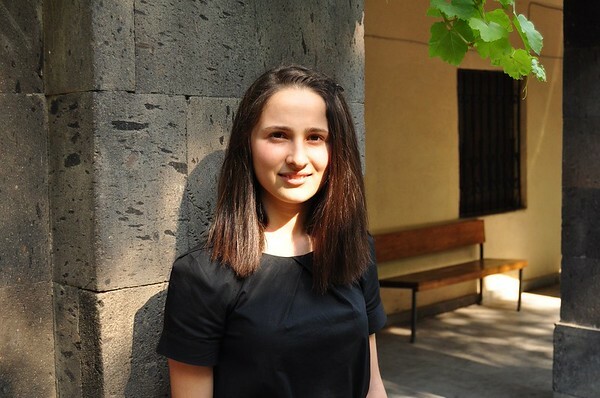 Another – Mardigian – Scholarship recipient is Lilya Arzumanyan a student at Yerevan State University. Three years ago, she lost her father in an accident and now lives with her mother and brother. Lilya is from Armenia’s south-eastern province Tavush and began to pursue journalism well before she was accepted to study in Yerevan. Since 2013, she has been a correspondent for the Berd Women’s Resource Center Foundation’s “We Are” magazine, covering urgent problems of the border region. Once she graduates, Lilya intends to return to her hometown of Berd to work as a journalist and pursue new goals.